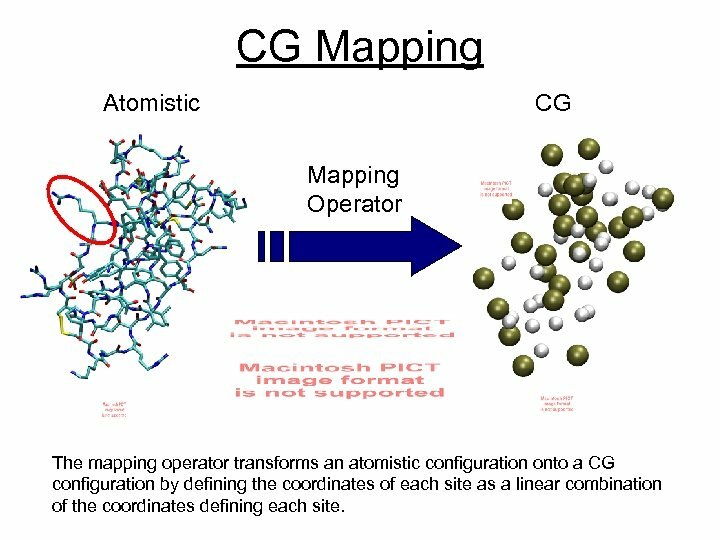 CG Mapping Atomistic CG Mapping Operator The mapping operator transforms an atomistic configuration onto a CG configuration by defining the coordinates of each site as a linear combination of the coordinates defining each site. 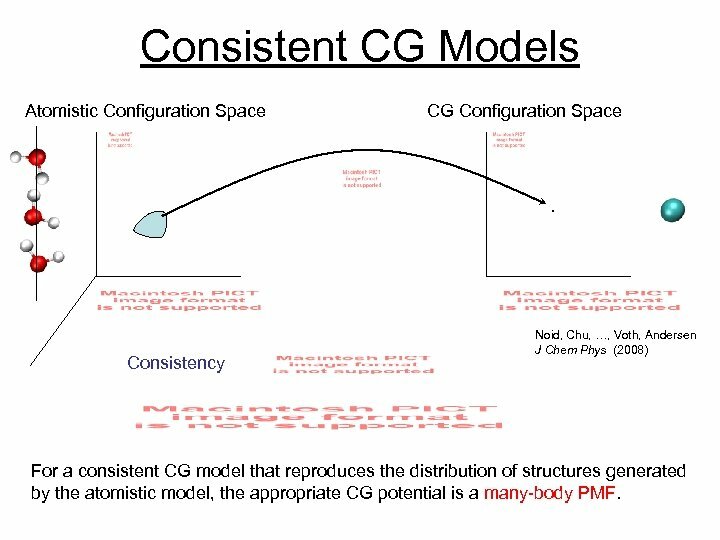 Consistent CG Models Atomistic Configuration Space Consistency CG Configuration Space Noid, Chu, …, Voth, Andersen J Chem Phys (2008) For a consistent CG model that reproduces the distribution of structures generated by the atomistic model, the appropriate CG potential is a many-body PMF. 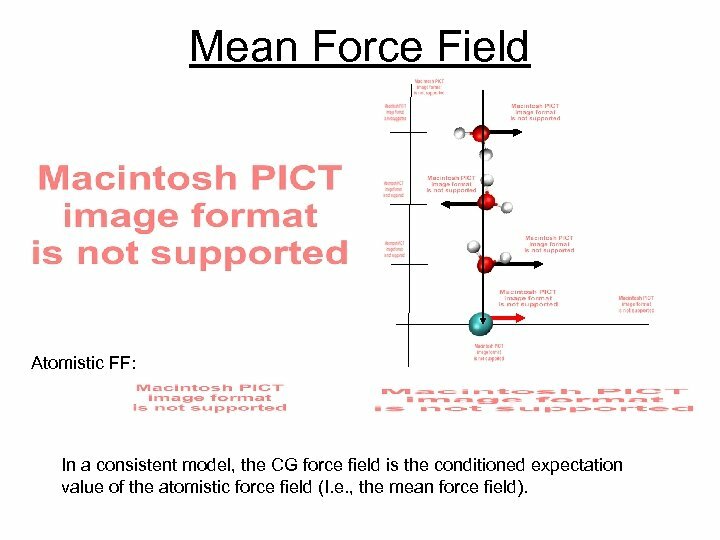 Mean Force Field Atomistic FF: In a consistent model, the CG force field is the conditioned expectation value of the atomistic force field (I. e. , the mean force field). 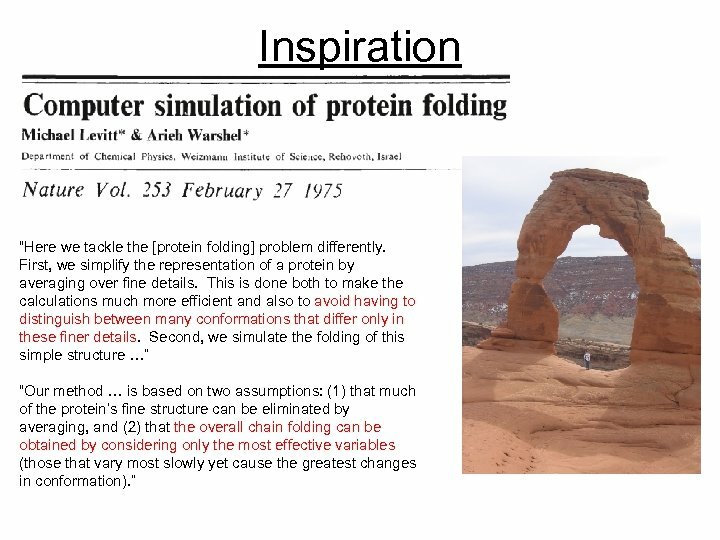 MS-CG Variational Principle for the PMF Space of force fields of r n (atomistic) Space of force fields of R N (CG) Noid, Chu, …, Voth, Andersen J Chem Phys (2008) The MS-CG variational principle determines the many-body PMF through a geometric optimization problem in the space of CG force fields. 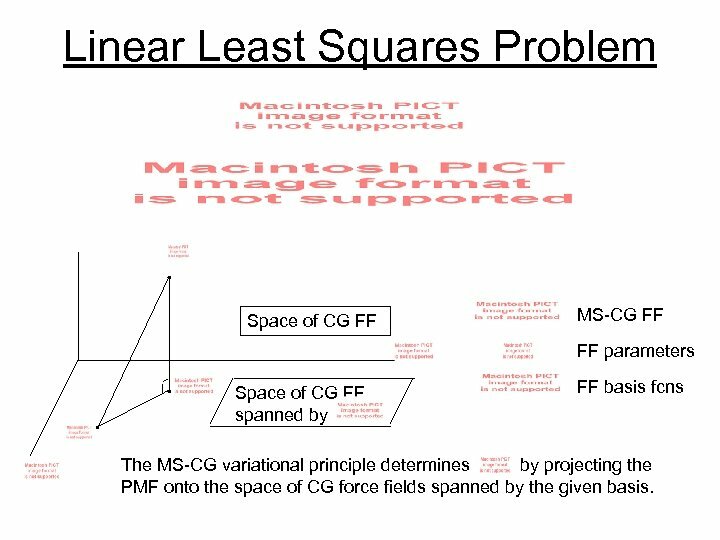 Linear Least Squares Problem Space of CG FF MS-CG FF FF parameters Space of CG FF spanned by FF basis fcns The MS-CG variational principle determines by projecting the PMF onto the space of CG force fields spanned by the given basis. 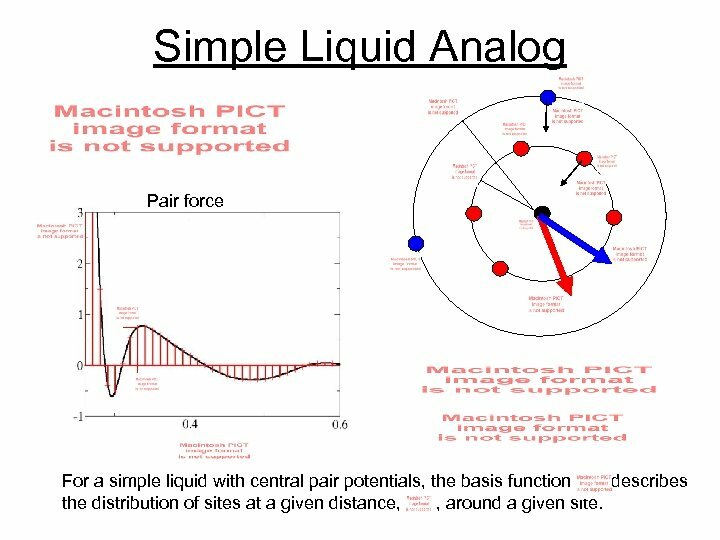 Simple Liquid Analog Pair force For a simple liquid with central pair potentials, the basis function describes the distribution of sites at a given distance, , around a given site. 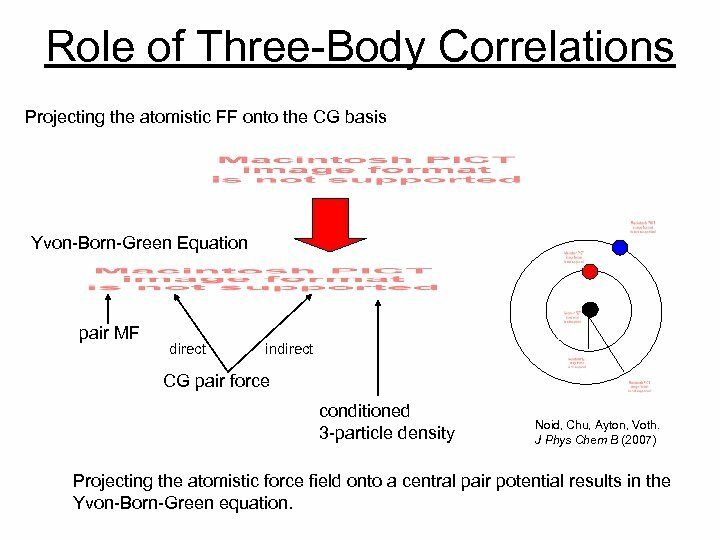 Role of Three-Body Correlations Projecting the atomistic FF onto the CG basis Yvon-Born-Green Equation pair MF direct indirect CG pair force conditioned 3 -particle density Noid, Chu, Ayton, Voth. J Phys Chem B (2007) Projecting the atomistic force field onto a central pair potential results in the Yvon-Born-Green equation. 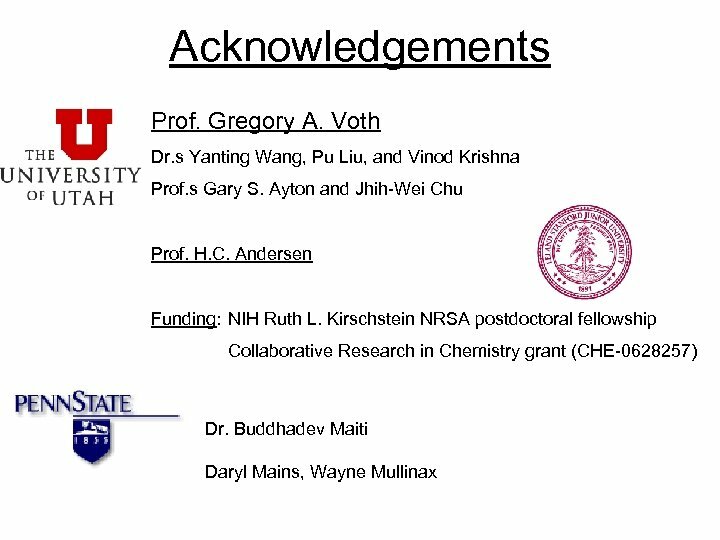 Role of 3 -Body Correlations II Noid, Chu, Ayton, Voth. 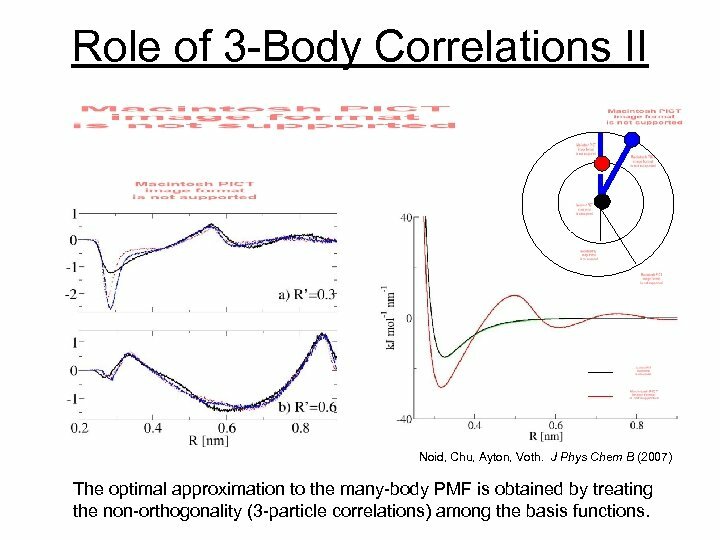 J Phys Chem B (2007) The optimal approximation to the many-body PMF is obtained by treating the non-orthogonality (3 -particle correlations) among the basis functions. 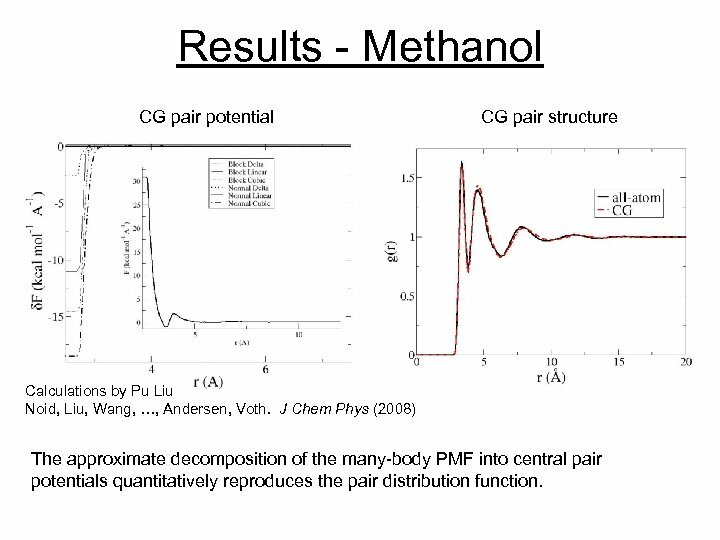 Results - Methanol CG pair potential CG pair structure Calculations by Pu Liu Noid, Liu, Wang, …, Andersen, Voth. J Chem Phys (2008) The approximate decomposition of the many-body PMF into central pair potentials quantitatively reproduces the pair distribution function. Consistent Momenta Distribution Restrictions upon the model: 1. 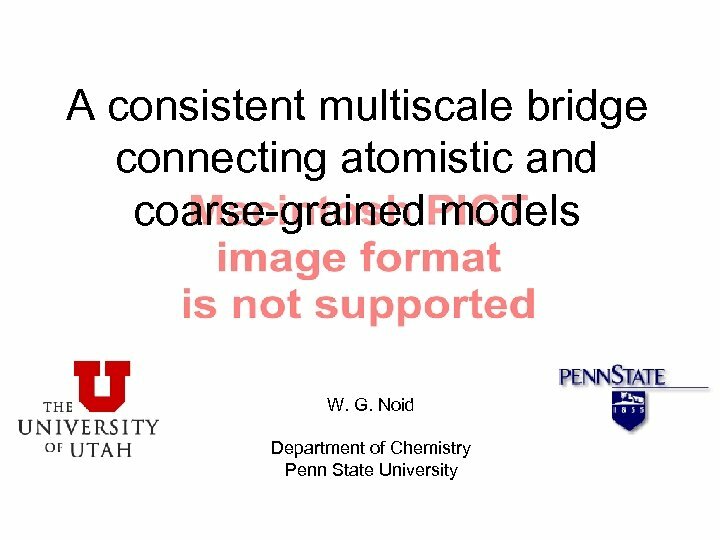 CG Mapping: No atom can be involved in more than one site. 2. Site Masses: Calculation by Pu Liu. Noid, Liu, Wang, …, Andersen, Voth. 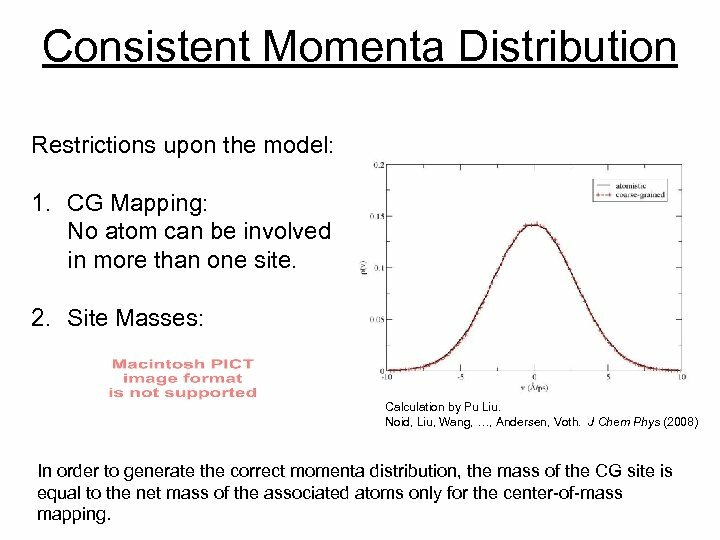 J Chem Phys (2008) In order to generate the correct momenta distribution, the mass of the CG site is equal to the net mass of the associated atoms only for the center-of-mass mapping. 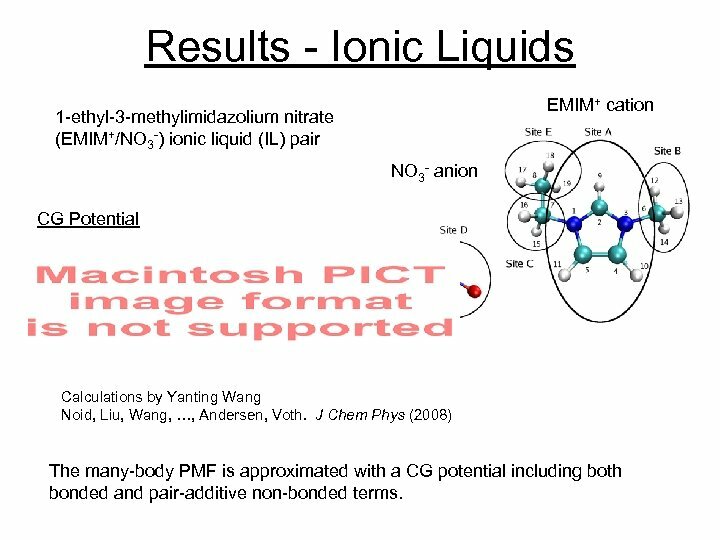 Results - Ionic Liquids EMIM+ cation 1 -ethyl-3 -methylimidazolium nitrate (EMIM+/NO 3 -) ionic liquid (IL) pair NO 3 - anion CG Potential Calculations by Yanting Wang Noid, Liu, Wang, …, Andersen, Voth. J Chem Phys (2008) The many-body PMF is approximated with a CG potential including both bonded and pair-additive non-bonded terms. Intramolecular CG Interactions Bond. Stretch A-C Bond. Angle A-C-E Dihedral. Angle EMIM+ cation B-A-C-E Calculations by Yanting Wang Noid, Liu, Wang, …, Andersen, Voth. 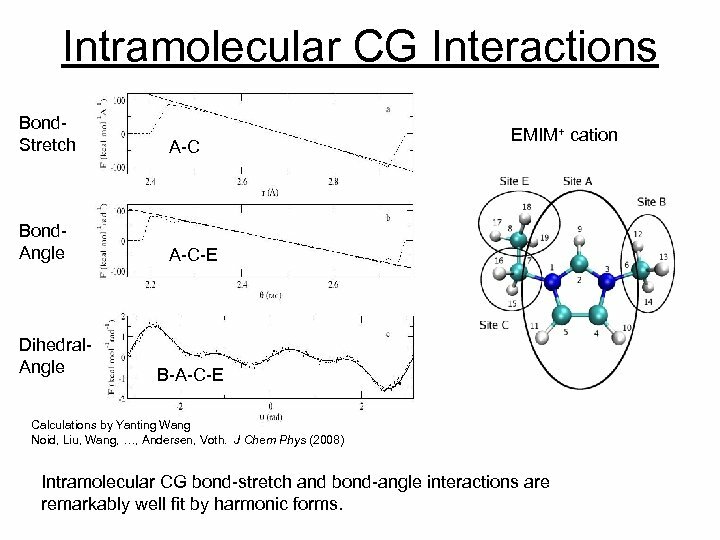 J Chem Phys (2008) Intramolecular CG bond-stretch and bond-angle interactions are remarkably well fit by harmonic forms. 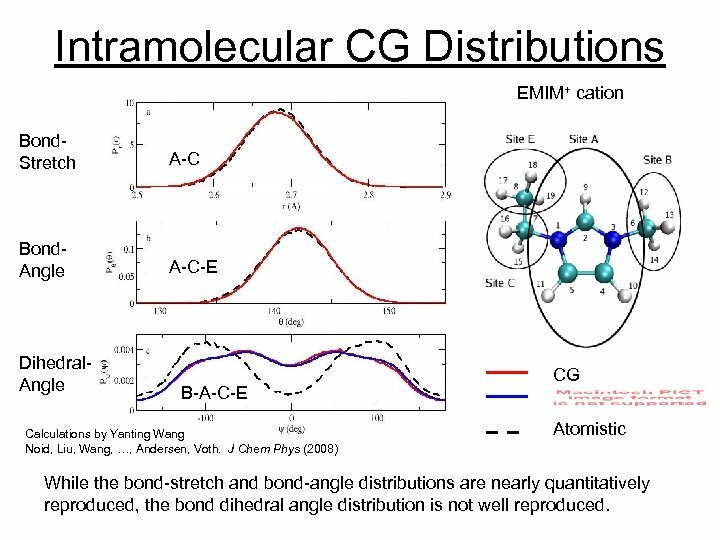 Intermolecular CG Interactions Short-ranged Nonbonded A-A EMIM+ cation A-D NO 3 - anion D-D E-E Calculations by Yanting Wang Noid, Liu, Wang, …, Andersen, Voth. 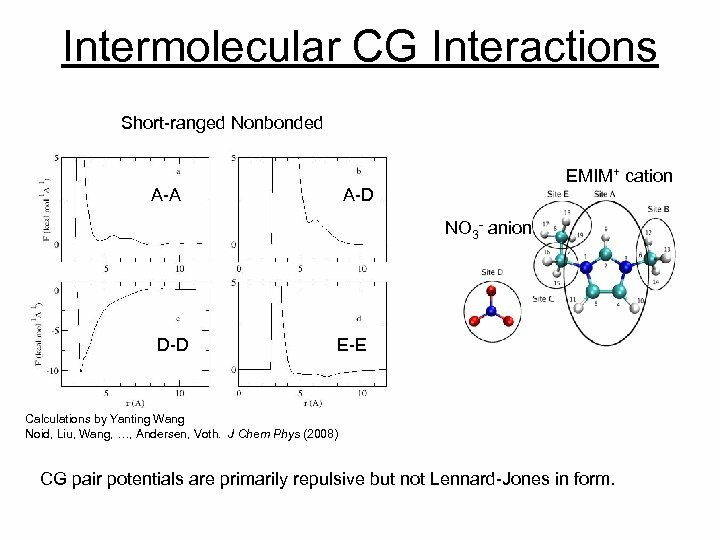 J Chem Phys (2008) CG pair potentials are primarily repulsive but not Lennard-Jones in form. Intramolecular CG Distributions EMIM+ cation Bond. Stretch A-C Bond. Angle A-C-E Dihedral. Angle B-A-C-E Calculations by Yanting Wang Noid, Liu, Wang, …, Andersen, Voth. J Chem Phys (2008) CG Atomistic While the bond-stretch and bond-angle distributions are nearly quantitatively reproduced, the bond dihedral angle distribution is not well reproduced. 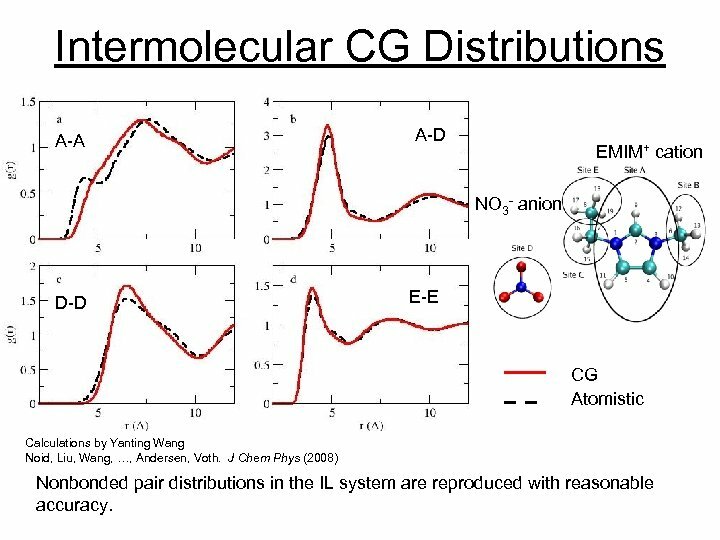 Intermolecular CG Distributions A-A A-D EMIM+ cation NO 3 - anion D-D E-E CG Atomistic Calculations by Yanting Wang Noid, Liu, Wang, …, Andersen, Voth. J Chem Phys (2008) Nonbonded pair distributions in the IL system are reproduced with reasonable accuracy. 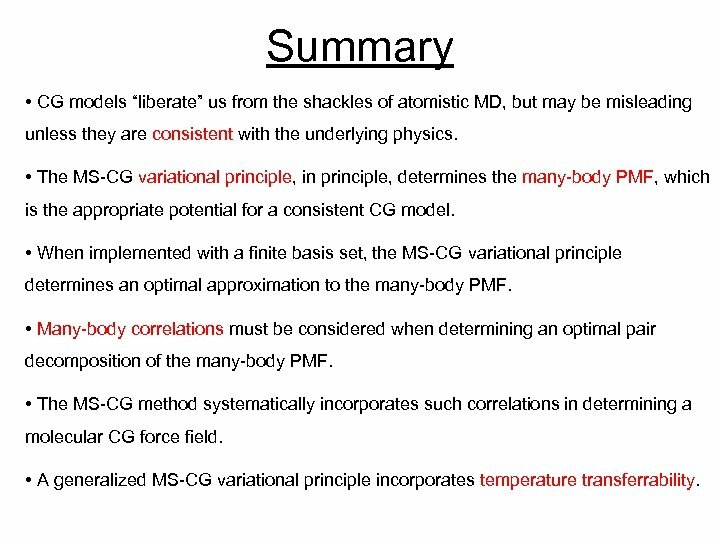 Summary • CG models “liberate” us from the shackles of atomistic MD, but may be misleading unless they are consistent with the underlying physics. 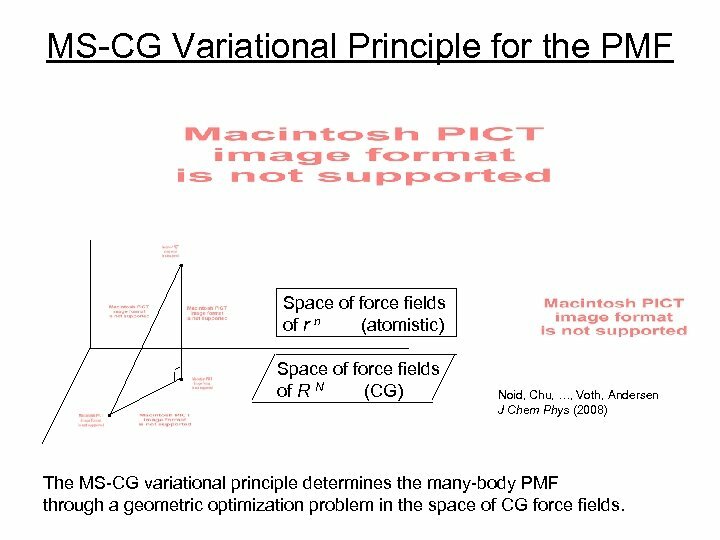 • The MS-CG variational principle, in principle, determines the many-body PMF, which is the appropriate potential for a consistent CG model. 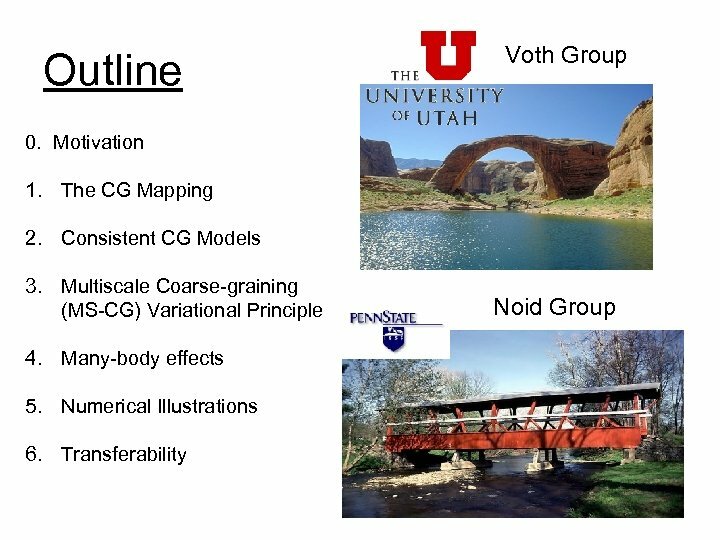 • When implemented with a finite basis set, the MS-CG variational principle determines an optimal approximation to the many-body PMF. • Many-body correlations must be considered when determining an optimal pair decomposition of the many-body PMF. • The MS-CG method systematically incorporates such correlations in determining a molecular CG force field. 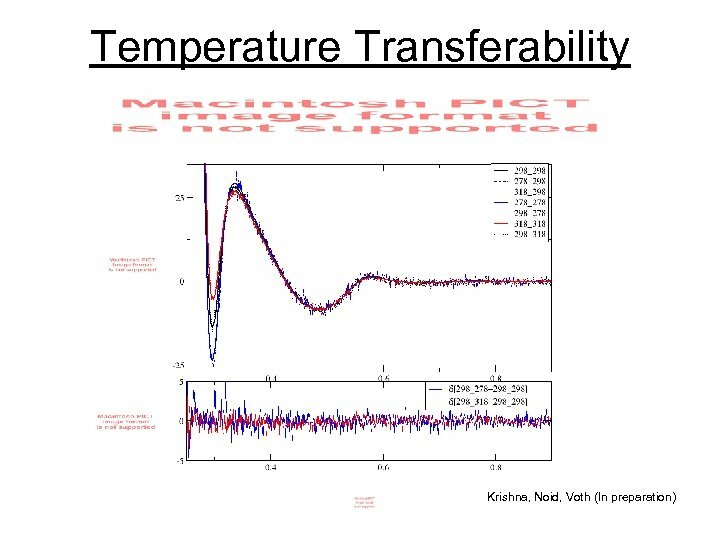 • A generalized MS-CG variational principle incorporates temperature transferrability.